Penywaun Bed and Breakfasts. Compare latest rates and Live availability for all your favourite places and places you have always wanted to go using our new My Shortlist feature. Click + to add to your Shortlist. Bed and Breakfasts in Penywaun, Glamorgan for 1 night from Fri Apr 19, 2019 to Sat Apr 20, 2019 within 10 miles, in an Average Nightly price range of £1 to £200. Family run hotel with 8 en-suite bedrooms. Bed and breakfast at Ã‚Â£40 for single room, Ã‚Â£55 for double. Family room available. Restaurant serves a wide variety of tasty meals. Close to the A465 Heads of the Valley road and rail access to Cardiff. Traditional village pub with 4 ensuite Family(D&ampS)Twin(2S)2 small doubles. Central to S &amp Mid-Wales.5 mins. Bryn Bach Park and Bikepark Wales. The new and vibrant Bessemer Hotel is located in the Dowlais Valley allowing easy access to many of the local and national sites of interest in the area. br / br / br / br / The hotel aims to set new standards in the hotel industry. The bedrooms are among the finest to be found anywhere. The rooms are just that little bit larger and offer facilities including a daily paper to make your stay as comfortable as possible. At the Bessemer guests can dine in the Carvery Grill which offers both a la carte and a carvery counter. There are also three well stocked bar areas ideal for relaxing or meeting friends. br / br / br / br / The Bessemer Hotel is ideally placed for local exploration and handily situated for a journey breaker or base to work from taking the stress out of any visit. br / br / br / br / The Bessemer is proud of its reputation for good food friendly service and relaxed atmosphere. We can assure you that your stay will be a pleasant one. Set 2.8 km from Cyfarthfa Castle in Merthyr Tydfil, Tredegar Arms Hotel features free WiFi access and free private parking. A TV is provided. All rooms are en-suite, with a microwave and a refrigerator. There is a shared lounge at the property. The nearest airport is Cardiff Airport, 41 km from Tredegar Arms Hotel. The Lamb & Flag has re-opened its doors after the unfortunate blaze. Now fully refurbished along with a new function room letting rooms and a bright and comfortable bar/restaurant seating area. We now offer a full and varied menu from delicious classics to daily specials. br / br / br / br / We also have a beautiful large garden with a very picturesque setting and recently opened childrens play area. We are situated 2 miles from Pontneddfechan which is on the edge of the Brecon Beacons National Park which boasts very many splendid waterfalls and some fantastic walks. Situated in the Brecon Beacons National Park, Nant Ddu Lodge offers 3-star accommodation in stunning South Wales. It has a spa, a swimming pool, and a fitness centre on site. WiFi is available in all areas. Rooms at Nant Ddu are spacious and warmly decorated, with carpeted floors, TVs and tea/coffee making facilities. A complimentary Welsh cooked breakfast is offered every morning. Free off-road private parking is also available. The hotel has a bar area with an open log fire, and a bistro restaurant serving food made from local ingredients. Guests can also enjoy a varied wine list. Nant Ddu is surrounded by picturesque mountains, beautiful hills, and grassy moorland. There are a number of country walks, and guests can fish in the nearby reservoirs. The Rhymney House Hotel is a friendly family run business located on the outskirts of Rhymney. 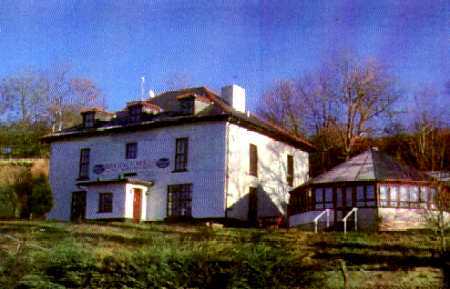 The Rhymney House was built c1801 as the residence of the manager of the Rhymney Iron Company. It is a grade II listed building. As a family run hotel we offer a warm welcome to the business traveller tourist and contractor. Feel at home as you enjoy a drink from the well stocked bar as well as a chat with the locals in front of the fire. Free Wi Fi available. We have two Tudor style bars one with some original stonework. We also have a restaurant which seats 30 people. We are close to the A465 Heads of the Valleys road which runs between Abergavenny (30 mins) and Swansea (1 hour) andthe A470 which gives access to Cardiff (40 mins) and the M4. 5 minutes drive to Bryn Bach Park.